The ‘813 patent provides for the use of a single-name for people who wish to play online games. In Microsoft’s case, this invention applies to what we know as Gamertags, which are personalized names picked by a user whenever he registers for Xbox Live. This gamertag becomes the player’s own personal identification name, and allows other players to recognize him whenever he is online. The invention allows a player’s information to be stored under the gamertag, including all accomplishments, stats, and awards achieved during a game. 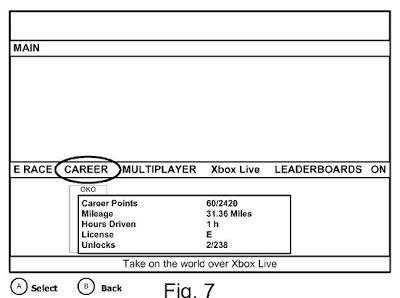 The player also has the ability to have his accomplishments (such as unlocking an achievement while playing an Xbox game) tracked when he is offline. Whenever a player logs back onto Xbox Live, the accomplishments achieved when offline are uploaded to the player’s account and can be viewed and tracked by his online friends. Systems and method for providing a single sign in a gaming console that associates online activity that is out-of-game/cross game, and/or online activity that is in-game, and/or activity that is offline and in-game with that account. While online, a service tracks activity of gamers and provides usage statistics in a profile. While offline, the game console tracks the player’s activity via a mechanism to collect detailed information about a specific player’s in-game statistics and accomplishments. The offline activity is cached and uploaded when the console connects to the online service. Players can accumulate achievements offline that are credited towards online activities. 1. In a gaming console, a method of providing a unique player identity, said method comprising: receiving a credential, at the gaming console, associated with a profile for a user; validating the credential; executing a videogame while the gaming console is offline, executing including executing a play of the videogame only on the gaming console; determining that an achievement associated with the videogame has been earned during the play of the videogame; caching offline user activity, at the gaming console, the offline user activity occurring during the play of the videogame; and transmitting, from the gaming console, when the gaming console is online subsequent to the play of the videogame, a signal indicative of earning the achievement to a service provider configured to publish the profile for the user in an interactive guide accessible to remote user devices, wherein the profile includes a username, a picture chosen by the user, videogame statistics accumulated while playing videogames, information indicative of affiliations of the user, and videogame achievements earned while playing videogames.